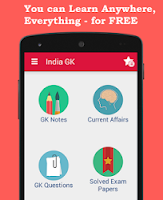 Home » Current Affairs , Current Affairs 2015 , First in World , General Science , Science GK , World GK » What is MERS ? 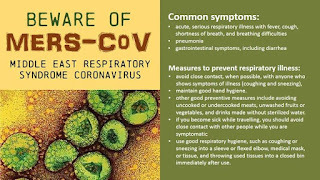 Middle East Respiratory Syndrome (MERS) is an illness caused by a virus (more specifically, a coronavirus) called Middle East Respiratory Syndrome Coronavirus (MERS-CoV). MERS affects the respiratory system (lungs and breathing tubes). Most MERS patients developed severe acute respiratory illness with symptoms of fever, cough and shortness of breath. About 3-4 out of every 10 patients reported with MERS have died. Health officials first reported the disease in Saudi Arabia in September 2012. Source of the virus: MERS-CoV is a zoonotic virus that is transmitted from animals to humans. The origins of the virus are not fully understood but, according to the analysis of different virus genomes, it is believed that it originated in bats and was transmitted to camels sometime in the distant past. Symptoms: The clinical spectrum of MERS-CoV infection ranges from no symptoms (asymptomatic) or mild respiratory symptoms to severe acute respiratory disease and death. A typical presentation of MERS-CoV disease is fever, cough and shortness of breath. Pneumonia is a common finding, but not always present. Gastrointestinal symptoms, including diarrhoea, have also been reported. Severe illness can cause respiratory failure that requires mechanical ventilation and support in an intensive care unit. Approximately 36% of reported patients with MERS-CoV have died. The virus appears to cause more severe disease in older people, people with weakened immune systems, and those with chronic diseases such as cancer, chronic lung disease and diabetes. - Middle East respiratory syndrome (MERS) is a viral respiratory disease caused by a novel coronavirus (MERS‐CoV) that was first identified in Saudi Arabia in 2012. 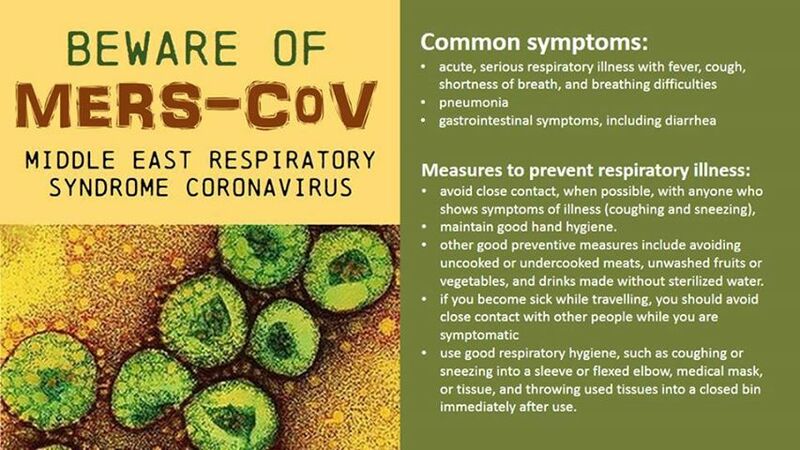 - Coronaviruses are a large family of viruses that can cause diseases ranging from the common cold to Severe Acute Respiratory Syndrome (SARS). - Typical MERS symptoms include fever, cough and shortness of breath. Pneumonia is common, but not always present. Gastrointestinal symptoms, including diarrhoea, have also been reported. - Approximately 36% of reported patients with MERS have died. - Although the majority of human cases of MERS have been attributed to human-to-human infections, camels are likely to be a major reservoir host for MERS-CoV and an animal source of MERS infection in humans. However, the exact role of camels in transmission of the virus and the exact route(s) of transmission are unknown. - The virus does not seem to pass easily from person to person unless there is close contact, such as occurs when providing unprotected care to a patient.